Here we have a story of a couple who came to Gaudium IVF for their infertility treatment. The couple was married for 8 years and had their first child 6 years back which was conceived naturally. So theirs was a case of secondary infertility. Secondary infertility is then the couple conceived their first child naturally but are unable to conceive afterwards. With high hopes, the couple booked an appointment with us for their infertility treatment in Delhi. When the couple reached us, they were highly disappointed and stressed since they were trying since past 4 years for their second child but were failing constantly. After doing HSG, the doctors came to know that the reason behind failed conception was bilateral tubal block in the woman. An HSG is an X-ray test that looks at the inside of the uterus and fallopian tubes to see where the problem lies. With our high success rates and our ability to treat even the most complicated cases, people trust us and come to us after getting failed elsewhere. Before all our treatments, we make sure that the couple undergoes a counselling by our counsellor to release all of their stress and be free of all sorts of questions and doubts they have in their minds and then commence the treatment with a positive state of mind. Fallopian tubal block hinders the fertilisation of the egg and sperm and so conception is not possible. Since the tubal block in this case was beyond repair, a customised treatment protocol combining IVF was designed by the expert team at Gaudium. The eggs were fertilised outside the female body and the resulting embryo was transferred to the patient’s uterus. The woman successfully conceived a singleton pregnancy with our treatment in her first attempt itself. 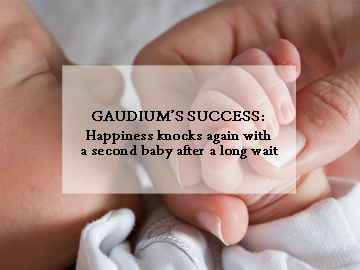 The couple said that it was only because of Team Gaudium and their advanced treatments that happiness knocked their door again after a long wait with their second child. On behalf of Team Gaudium, we thank them for putting their trust in us and are glad that yet again we achieved in giving hope to the hopeless. This could be your happy story too. 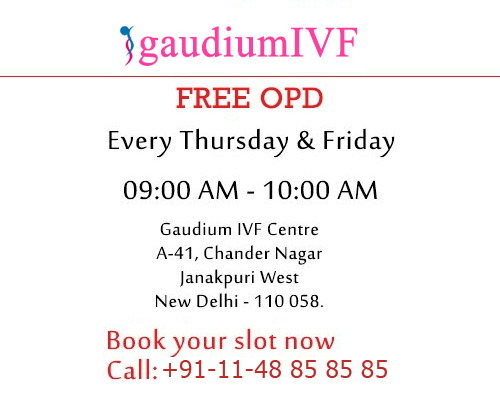 Put all your worries behind and walk-in for a free consultation* at Gaudium IVF, the best IVF centre in Delhi and see your dreams turning into reality.